There is so much to see if you love history and and travel. A one-day stay is insufficient. At least 2 nights must be spent in Bagan. I spent one night in Mount Popa and then travel by the van to Bagan. Bagan is filled with history and temples and pagodas are everywhere as previous kings built them over several generations. 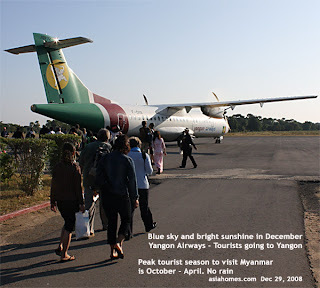 Domestic airlines are packed with tourists in December as Bagan is a UNESCO's World Heritage Site. The Shwesandaw Pagoda teems with tourists only in the evening (Lonely Planet - Myanmar) only in the evening. This was true as tourists from various countries climb high up to view the beautiful sunset and see the surrounding green fields. There is a big terrace at the top and it was a beautiful sunset on Dec 28, 2008. Some younger Caucasian tourists cycle there as hotels do rent bicycles. Older ones take cars or horse carts. 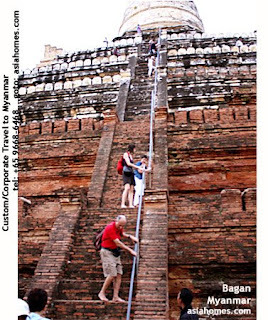 If I am not mistaken, Bagan must be the most visited tourist place in Myanmar for Caucasians. Most of the Caucasian tourists were Europeans. They did not converse in English and were likely to be Germans and French. The small airport and the plane was packed with tourists on Dec 29, 2008 when I was there.